Ground-breaking revolutions in Canadian Law most often occur at the Appellate level. Perseverance is not simply a strength of the Lawyers at Brodsky, Amy, and Gould—it is part of our ideology. Cutting edge advancements in the law are created at the Appeal stage. Our office pioneered such advancements in well-known cases including R. v. Lavallee, an expansion in the law of Self-Defence, R. v. Chaulk, the leading case on the defence of Not Criminally Responsible Due to Mental Disorder, and more recently R. v. Seymour, an important case on Entrapment in the context of police investigatory techniques. The experienced Counsel at Brodsky, Amy, and Gould have a rich history of innovative Appeals that have changed the law in Canada. We have argued cases successfully at the Manitoba Court of Appeal, the highest court in Manitoba, and the Supreme Court of Canada. Anyone convicted of a criminal offence has the right to appeal their conviction. After being sentenced, those who have been convicted of an offence may seek leave to appeal their sentence. Depending on the nature of the appeal, an appellate court can order a new trial be heard, overturn your conviction, or reduce your sentence. 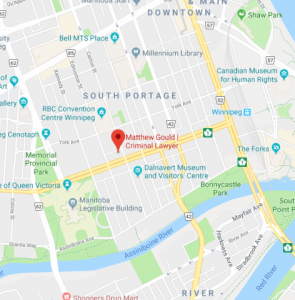 For less serious offences, where the Crown has elected to proceed summarily in the Provincial Court, appeals are heard in the Court of Queen’s Bench in Manitoba. For more serious charges where the Crown proceeded by Indictment, the appeal is heard in the Manitoba Court of Appeal. It is important to contact a lawyer as soon as possible if you are considering appealing your conviction or sentence as the time limit is 30 days after the conclusion of your case. In some cases, the timeline can be extended, however it important to move quickly to avoid potential issues with filing your appeal. Appeals are an integral part of the Legal process. However, appealing a conviction or sentence is a complicated process that requires a careful understanding of the principles and law that apply to your case. Counsel at Brodsky, Amy, and Gould can navigate your case through the important procedures, timelines, and legal arguments required in the appeal process.